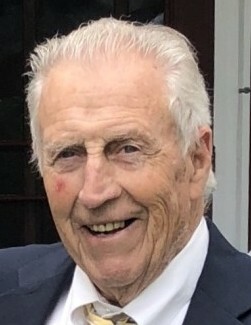 William H. Ward, 85, of Charlevoix, passed away on Feb. 5, 2019, at the Meadow Brook Medical Care Facility in Bellaire. William (Bill) was born on July 28, 1933, in Charlevoix, the son of Bernie and Mae (Hall) Ward. As a young man, he worked at the family’s fishing and boat business, Ward Brothers Boats in Charlevoix. He not-so-fondly remembered picking night crawlers for a penny apiece to sell to customers. William served in the U.S. Navy and went on to become a successful hydraulic engineer and salesman in the Detroit area. He loved a good laugh, ice cream, cutthroat family Hearts games and a cold Miller High Life. He enjoyed fishing, boating and was an avid golfer. Many summer days he could be found at the Muni with his best golf buddies. He is survived by four children, William “Scott” (Sue) Ward of Charlevoix, Tom (Rhonda) Ward of Bellaire, Wendy Ward of Madison Heights, MI, Tracy (Bruce) Ward Graham of Charlevoix, as well as eight grandchildren and four great-grandchildren. He was preceded in death by his parents, his brother Bernie Ward Jr., and his sister, Joan Goldberg. A visitation for family and friends will take place on Saturday, Feb. 9, 2019 from 4 p.m- 6 p.m. at the Winchester Chapel of Mortensen Funeral Homes. A party to celebrate Bill’s life will be held the summer of 2019. Memorial contributions may be made to the Alzheimer’s Association, Greater Michigan Chapter, 25200 Telegraph Rd., Ste. 100, Southfield, MI, 48033-7443. Bill’s family thanks the staff at Meadow Brook for their kindness and care.